Ardal O'Hanlon (/oʊˈhænlən/; born 8 October 1965) is an Irish comedian and actor. 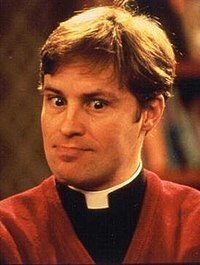 He played Father Dougal McGuire in Father Ted and George Sunday in My Hero. O'Hanlon was born in 1965 in Carrickmacross, County Monaghan, Ireland, the son of Rory O'Hanlon, an Irish politician and doctor, and has five siblings. RTÉ's Who do you think you are? programme on Monday 6 October 2008 examined Ardal's family tree. He discovered that his paternal grandfather, Michael O'Hanlon, a UCD medicine student, had joined the Irish Republican Army during the Irish War of Independence and was a member of Michael Collins's squad which assassinated British secret service agents on the morning of Bloody Sunday. Details of his grandfather's activities survive in UCD Archives, as well as Blackrock College. It also transpired that on his mother's side he was a close relative of Peter Fenelon Collier, the founder of Collier's Weekly and Collier's Encyclopedia. O'Hanlon was schooled in Blackrock College in Dublin and graduated, in 1987, from the National Institute for Higher Education, Dublin (now Dublin City University) with a degree in Communications Studies. Together with Kevin Gildea and Barry Murphy, Ardal O'Hanlon founded the International Comedy Cellar, upstairs in the International Bar on Dublin's South Wicklow Street. Dublin had no comedy scene at the time. As a stand up, O'Hanlon won the Hackney Empire New Act of the Year competition in 1994. For a time he was the presenter of The Stand Up Show. He was spotted by Graham Linehan, who was to cast him as Father Dougal McGuire in Father Ted (1995–98). In 1995 he received the Top TV Comedy Newcomer at the British Comedy Awards for this role. In 1995, he appeared (as Father Dougal) in a Channel 4 ident ("Hello, you're watching.... television"), and during Comic Relief on BBC1. This was followed by the award-winning short comedy film Flying Saucer Rock'n'Roll. O'Hanlon moved into straight acting alongside Emma Fielding and Beth Goddard in the ITV comedy-drama Big Bad World, which aired for two series in summer 1999 and winter 2001. He also played a minor role in The Butcher Boy as Joe's (Francie's best friend) father, and appeared in an episode of the original Whose Line is it Anyway?. In 2000, O'Hanlon starred in the comedy series My Hero, in which he played a very naive superhero from the planet Ultron. His character juggled world-saving heroics with life in suburbia. He stayed in the role until early 2005 and was replaced by James Dreyfus for series 6 in 2006. He also provided the voice of the lead character in the three Christmas television cartoon specials of Robbie the Reindeer. He appeared in the 2005 BBC One sitcom Blessed, written by Ben Elton; at the 2005 British Comedy Awards, it was publicly slated by Jonathan Ross, albeit in jest. Towards the end of 2005, he played an eccentric Scottish character, Coconut Tam, in the family-based film, The Adventures of Greyfriars Bobby. Although more commonly on television, he has appeared on radio - on 18 July 2011, he appeared on Quote... Unquote. Appropriately, one of his questions concerned a quotation from Father Ted. In 2006, O'Hanlon wrote and presented an RTÉ television series called Leagues Apart, which saw him investigate the biggest and most passionate football rivalries in a number of European countries. Included were Roma vs Lazio in Italy, Barcelona vs Real Madrid in Spain, and Galatasaray vs Fenerbahce in Turkey. He followed this with another RTÉ show, So You Want To Be Taoiseach? in 2007. It was a political series where O'Hanlon gave tongue-in-cheek advice on how to go about becoming Taoiseach of Ireland. Both programmes went some way towards freeing O'Hanlon from his association with the character of Dougal in the minds of Irish audiences. He appeared in the Doctor Who episode "Gridlock", broadcast on 14 April 2007, in which he played a cat-like creature named Thomas Kincade Brannigan. O'Hanlon appears in Series 3 of the TV show Skins, playing Naomi Campbell (Lily Loveless)'s Politics teacher named Kieran, who attempted to kiss her. He then went on to form a relationship with Naomi's mother (Olivia Colman). O'Hanlon plays the lead role in Irish comedy television programme Val Falvey, TD on RTÉ One. He has recently[when?] performed in the Edinburgh Fringe. In February 2011, O'Hanlon returned to the Gate Theatre, Dublin starring in the Irish premiere of Christopher Hampton's God of Carnage, alongside Maura Tierney. In 2011, he appeared in the comedy panel show Argumental. O'Hanlon has written a novel, The Talk of the Town (known in the United States as Knick Knack Paddy Whack), which was published in 1998. The novel is about a teenage boy, Patrick Scully, and his friends. in February 2015 he officially launched the 2015 Sky Cat Laughs Comedy Festival which takes place in Kilkenny from 28 May- 1 June. He plays the role of Peter the milkman in Sky 1 sitcom After Hours. Ardal has been doing stand up for many years appearing on many shows including Live at the Apollo, Michael McIntyre's Comedy Roadshow and Dave's One Night Stand. In 1994 he won the Hackney Empire New Act of the Year. O'Hanlon is married to Melanie, whom he met as a teenager, and with whom he has three children: Emily, Rebecca and Red. He is a supporter of Leeds United. ^ Masters, Tim (22 March 2007). "Fans mad for Doctor's new companion". BBC News. Archived from the original on 28 March 2007. Retrieved 3 April 2007. ^ "Ardal O'Hanlan launches this year's Cats Laughs as the festival comes of age". evoke.ie. 26 February 2015. ^ simon_duddy (simon_duddy@vnu.co.uk) (1 October 1998). "Flying Saucer Rock'n'Roll (1998)". IMDb. Retrieved 5 October 2015. ^ "BBC - Top of the Pops 2 - Trivia". bbc.co.uk. Retrieved 5 October 2015. ^ Dwyer, Ciara (7 May 2012). "Ardal O'Hanlon: Stand up for a life well lived". The Irish Independent. Retrieved 11 July 2015. ^ Tench, Matt (3 August 2003). "My team: Ardal O'Hanlon". The Guardian. Retrieved 11 July 2015. This page was last modified on 2 September 2016, at 19:22.